I'm a mom, a wife, teacher, and I have a garden & chickens. Sometimes I think about all the happenings in my life and I get exhausted thinking about what needs to be done. With a day like that - energy is vital. I try to eat healthy most of the time, but that's not always enough. Most of the time I turn to supplements for help. Not all of them do the job - but this one sure did. Have you ever heard of it? I hadn't before I was sent a sample for a review. Now I cannot get enough of it! Check it out for yourself. The only bad part is that I needed to hide them because this guy kept taking them. I think he needs to get his own. I love you, Ward. But stay away from my ENERGYbits! I have had two very successful long runs with ENERGYbits. Not my most recent ones - maybe because I am out of ENERGYbits and need to replenish. One 10 miler and one 22 miler (with Carrie). During those runs I felt unbeatable and that I could run forever. Well, maybe not forever, but I definitely felt like I had "gas in the tank" afterwards. Yes, I felt pretty gosh darn good. But why? How can a green algae pill make me feel so good? So, then I turned to the ENERGYbits page - About Spirulina. You should definitely read about it here. 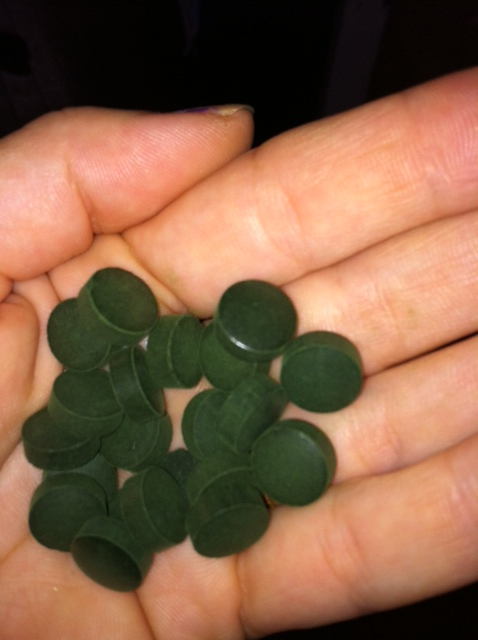 These little green pills are so powerful and incredibly good for you! 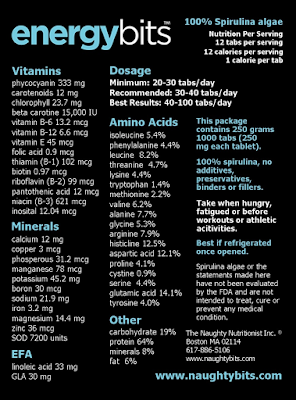 Check out ENERGYbits on facebook and follow them on twitter. I'm glad I did. Disclaimer: I was sent Energy Bits to try and review. My opinion is my own and not influenced in any way. I was not compensated for this post. I have heard so much about these and I follow them on twitter, may have to try them out! I got the sample too but haven't tried it. How many did you take each time? I really liked the Energy Bits too. I haven't ordered any, but I'm thinking about it. Sounds great, I just wish the price wasn't so high, $115 is a bit steep for me to give something a try. The price is what is killing me on these. that and did you chew them?... not good, but I didn't mind swallowing them. I haven't tried mine yet. I think I am a bit afraid of them! I need to re-try them. I had a little bit of a bad experience when I decided I was tough enough to chew one and then proceeded to throw it up :( I haven't really wanted to try them again since then, but I will eventually!